The Australian wine industry has had a jet-propelled couple of decades. Their long- established wine industry moved from a producer of inexpensive wines destined largely for the local market (and often sweet and/or fortified), to a giant of the global stage making fine wines across all price points. But this process has not been easy. Global competition is fierce, and with a glut of grapes on the international market, prices and profitability are hard to sustain. The world may have fallen in love with the wines of Australia, but new kids on the block – Chile, Argentina, South Africa – stole some of their market share, just as France and the rest of the ‘Old World’ began to fight back with improved wines and slicker marketing. Like all other wine producing nations, Australia needs to think of ways to refine their wine offering and to distinguish their wines from a world of competitors. It has to give the wine-loving public compelling reasons to engage with Australian wine. One campaign is attempting to prove that Australia is not one homogenous wine producing ‘factory’, but a multi-faceted country with many different climates, soils, and abilities to produce wines with a distinct sense of place. The ‘Regional Heroes’ campaign gives these regions, and the grape varieties in which they tend to specialise, a platform. The idea is to foster a better understanding of Barossa Shiraz, Margaret River Cabernet or Hunter Valley Semillon as distinctive regional styles. Wine Australia, the generic body promoting Regional Heroes, sent me a little set of three Pinot Noirs from Victoria’s Yarra Valley, as an example of how certain winemakers and certain grapes, are helping establish wines from these territories as ‘Regional Heroes’. Nice, quite pale crimson colour, with a nose that exudes fireside warmth of smoky oak with touches of chocolate, briar and truffly undergrowth over ripe, Autumnal berry fruit. There’s a little hint of something herby and green peppercorn-like, but very attractive. On the palate it has all that duvet-like warmth and softness, and though the mid-palate does give way fairly rapidly to nicely nippy tannins and acidity, this is deliciously drinkable. 88/100. Around £8.00, see all stockists on wine-searcher.com. Yering Statiom’s 2006 Pinot has a fairly deep colour and a subtle, quite tightly wound nose compared to the exuberant and youthful Windy Peak. Spices, cedar and some bramble fruit lead on to a palate with a nicely firm and juicy character, the tannins quite grippy and a core of spice and acidity adding fine definition. This is quite long, and stays savoury and food-friendly. Not quite so open-armed as the Windy Peak, but a definite suggestion that it has many years ahead of it yet. 89/100. £11.00-£12.00, see all stockists on wine-searcher.com. Quite a vivid colour, crimson just mellowing to ruby, with a lovely nose of briar and spice, with tobacco and a deep-set cherry and bramble fruit. The palate is perhaps the least fruity of the three wines, being somewhat lighter and less concentrated, but that mellow core of smoky, briary character and spiciness is balanced by good acidity, in a fairly subdued and slightly lean style. 87/100. 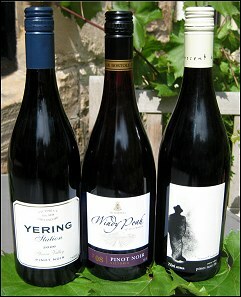 £13.00 – £14.00, see all stockists on wine-searcher.com.